If you want to sit on a terrace and watch the waves lap on the beach as the sun sets, the place to do it is on the Promenade des Anglais. This prestigious road has the most prestigious hotels, both the casinos, and a parade of Art Deco and Belle Epoch buildings sprinkled with more modern buildings in between. Some buildings stand resplendent, like being on the set of the roaring 1920s, others a little tired limping on from the 1970s and obviously not having any free love since then. 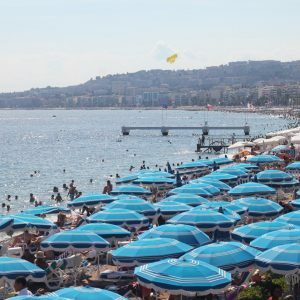 The Promenade des Anglais is divided into two halves: east of Boulevard Gambetta where the desirable property is and price and availability is at a premium, and west of Boulevard Gambetta where the price and desirability starts to rapidly drop off. The imposing and well respected Le Capitole stands like a fortress on the edge of the prestige end. Prime time is between Boulevard Gambetta and the Meridian Hotel. Much of the real estate is taken by the hotels, and the few free buildings have a waiting list of willing buyers. Those that do stick around for a while on the market are the ground or first floor, which are the noisiest and least prestigious. For an apartment with terrace expect to pay around €10,000/sqm, though this varies with size of terrace and quality of the building. If a property comes up here then it is important to put an offer in early, it will not stay on the market very long. 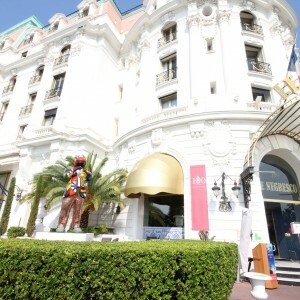 The two most prestigious buildings on the Promenade are the Hotel Negresco and the Palais de la Méditerranée. Both are arranged so that the front half on the Promenade is the hotel and the rear half made up of private freehold residences. The important point to note is that no apartments have sea views, only the hotel does. This does not make them bad investments, the buildings are spectacular and both locations excellent. The most accessible of the prestige buildings is Le Capitole which sees more turn-over of property due to its size. In a U shape, most apartments have a slice of sea view but not full panoramic. The terraces are large, enough for a dining table for a family, and the building and communal areas immaculately maintained. Being set back also makes the apartments relatively quiet. It is just off Gambetta so still on the desirable part of the Promenade. Crucially though, a good size two bedroom property with sea view and terrace can be had for €500,000-€600,000. As you head west of Le Capitole prices and desirability start to drop. We would recommend you head inwards away from the Promenade but remain within the golden square rather than continue west, but if a sea view is non-negotiable and your budget is under €500,000 then you may have no choice. Be warned that the centre of town can be a long walk away, nearly an hour and a half if by the airport, and buses stop running 8-9pm. The front may still appear glamourous but the buildings back onto Avenue Californie which is not quite so prestigious. We are told by property management companies that even further up the Promenade rental is good, so it need not be discounted completely, but we recommend doing the leg work to see exactly how far up the Promenade is an acceptable compromise for that sea view. There are two approaches to buying property on the Promenade. The first is to put it on your wish list, but be also prepared to look away from the sea front. If the view is important, there are also rooftop and park views if you wish to avoid vis-a-vis. The second is to ensure you have the cash ready and be prepared to put in an offer quickly when something comes up, taking a plane within days if necessary. Warning: if looking for a two bedroom apartment 60-70sqm on the Promenade with terrace for around €550,000 then this is our most demanded product, and it is first to offer secures. It was originally built in the early 1800s by the local English community and paid for by a vicar called Lewis Way. It started as a 2m wide dirt track called, in Nissart, the “Camin deis Anglés“, later rename “Promenade des Anglais” in 1860 when the French took possession of Nice. It first took the form as you see it today in 1836, designed by the town architect Antoine Scoffier. In 1854 it reached as far as Magnan, and finally was extended to where the airport is now by 1882. Originally it was seen as a winter retreat, the mild climate seen as an antidote to the cold British weather. Even Queen Victoria was officially chastised for spending too much time in Nice. The sea view was not originally even seen as an advantage, and you may note that the original palaces such as the Le Royal, Negresco, and Opera all have their main entrances facing away from the sea. 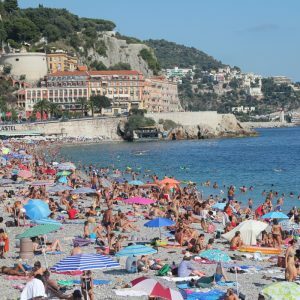 In fact the name “Promenade des Anglais” was used as a derisory term, implying only the English were crazy enough to walk along the chilly sea front when the locals were sheltering from the cold. Slowly the parks and villas were replaced with hotels and casinos. With the increasing popularity of the horseless carriage, or as we now call it the car, the road along the Promenade was enlarged 1929 and took on the look we now see today.